Daily Gracelines ADVENTure Day 2 Was Christmas Ever a Pagan Feast? It’s no surprise that the first week of Advent stands for hope, “the theological virtue by which we desire the kingdom of heaven and eternal life as our happiness, placing our trust in Christ’s promises and relying not on our own strength, but on the help of the grace of the Holy Spirit.” (Catechism, No. 1817). Truly, Advent is enveloped in the impending gift of Christ, trusting that He will provide in due time. As simple human beings, we are disadvantaged by our limited understanding of time and the timelines we frame our lives around. As a result, we misunderstand the importance and meaning of waiting and everything it represents. In fact, our lives are simply one groan for the next stage after another: as children we await high school, ready for a driver’s license and a later curfew; as teenagers, we long for college, a time in which we have freedom from our parents and more responsibility; as college students, we hurry ourselves through graduation, anticipating graduate school or those careers we just have to have; as single adults, we hurry through dating, chasing our emotions and fearing the timelines placed on us; as married couples, we dwell on our fertility, racing to have a baby; as parents, we rush from activity to activity, trying to stuff a week’s worth of “work” into one day; and it continues…until our time on this earth ends. We embrace the waiting and recognize that our entire life was created to wait; thus, the internal groaning really is about Him, and Him alone. From the moment of creation at the beginning of time, humans were created for and by God, to know Him, to love Him, and to serve Him. That’s it: we were simply made to glorify God; nothing more, nothing less. The highest of duties and greatest of opportunities, He made us simply for Himself. Thus, until we glorify Him in splendor in the heavens above, our life will always be incomplete, and we will remain in waiting. Truly, every single moment of our lives will include some undercurrent of groaning for more. As a Catholic woman, I see so often this mentality that the time of waiting is to be endured until the next best thing comes about, as if it’s something that can be cured by a person, a new place, a riveting job. Yet, the only thing we were truly created to wait for is His coming…our very own eternity with Him. Everything else is simply the means by which we wait. And every step and change of our lives is simply another opportunity to joyfully wait for Him. I have grappled with the reality of waiting as a single woman, a place that many fear or dread. I have watched many suffer from infertility, a cross they fight to carry day in and day out. I have taught individuals who experience deep pain at the hands of their families, a prison they find themselves caged within. Yet, our very own lives, regardless of the circumstances, are always about waiting, a lifelong journey steeped in either hope…or despair. One of my favorite verses from Scripture is from the Gospel of Luke. Our Mother travels to see Elizabeth just after the Angel Gabriel announces to Mary her pregnancy with our dear Lord. When Elizabeth hears Mary’s voice, the infant leapt in her very own womb and Elizabeth cried out to her, filled with the Holy Spirit, “Blessed are you who believed that what was spoken to you by the Lord would be fulfilled.” (Luke 1:45). Truly, Mary surrendered completely to the Father, embracing His Divine Plan no matter the cost. Why? Because she hoped in His promises; and she waited for Him and His will. Indeed, her life was filled with so much suffering as a result. Yet, she endured…joyfully. 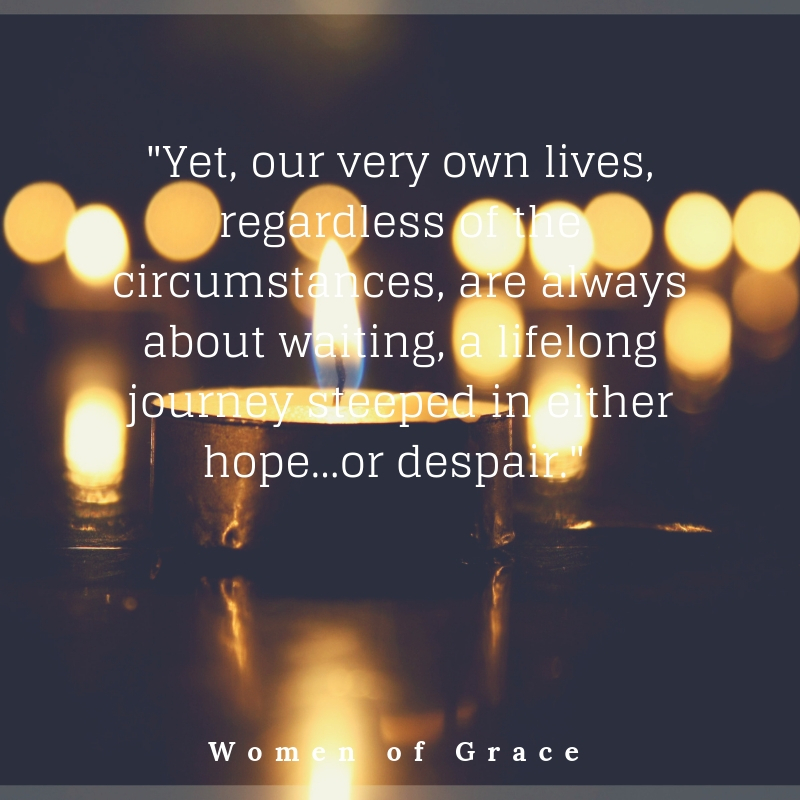 The question remains the same for each of us: will you await in hope, longing for His coming, recognizing that each moment of your life is about waiting, remembering that the rest of it is simply an opportunity He gives you to assist you on this journey?